Fully renovated in 2009, this hotel is located along Place de la République, which is easily reached via five Metro lines. 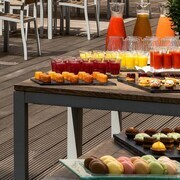 The on-site Le Dix restaurant serves a generous breakfast buffet (surcharge), along with a la carte lunch and dinner. Modern French cuisine takes center stage. 24-hour room service is available. A bar faces the bustling Place de la République. 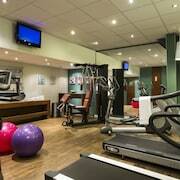 The hotel also offers a fitness facility, concierge services, and a business center. 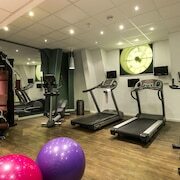 Crowne Plaza Paris Republique is a smoke-free property. 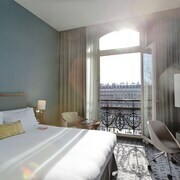 The hotel occupies a fully renovated 19th-century Neo-Baroque building. The on-site restaurant serves a generous breakfast buffet (surcharge), along with lunch and dinner. 24-hour room service is offered. Crowne Plaza Paris République's air-conditioned guestrooms include coffee/tea makers, minibars, complimentary wireless Internet access, and in-room safes. Club rooms include free lounge access. 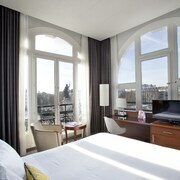 Crowne Plaza Paris Republique offers 328 air-conditioned accommodations with safes and coffee/tea makers. 26-inch LCD televisions come with satellite channels. Bathrooms include shower/tub combinations and hair dryers. This Paris hotel provides complimentary wireless Internet access. Housekeeping is provided daily.